Although keeping our fitness in check via regular exercise, it is also important for your health to ensure that you restore and recover correctly. There are two main ways in which you can do this, and they are Passive and Active recovery techniques. However, in this article we are going to focus mainly on the Passive trends which you can start practising right now. Therefore, if you want to find out more on how you can take your recovery regime to the next level, then keep on reading. Below are five examples of this type of recovery which we will explore further. Before discovering whether these techniques are something which will benefit your routine, we must first explore what passive recovery actually is. After an intense workout it is crucial that your body has time to recover and repair itself before the next scheduled training session. And under the umbrella of recovery, are two main types which have a number of classes and exercises within them. The one we are going to look into today is passive recovery; however the other type is called active. Passive recovery entails long periods of time where you allow your body to rest through remaining still and inactive. And within this type of recovery you will uncover a variety of techniques and activities which we will look into more in depth below. However, contrasting with this significant part of recovery is the other type – active. Active recovery is the exact opposite to relaxation as it forces your body to stretch and move to release any tension from exercises. Although the thought of another exercise after a workout seems daunting, active recovery involves low intensity movements across a slow period of time. Both of these types of recovery have their benefits and you will find a number of these when practising either of these methods. You will find that muscle tension is reduced, your body is in a heightened state of relaxation and the process of recovery, whichever you choose will help to calm the mind as well as the body. Therefore, looking into types of recovery which spike your interest the most is a great way to ensure that you are able to reduce the likelihood of injury after a hard training session or workout. When stepping into the cryotherapy chamber you can benefit from a number of positive effects in just a few minutes. The cooling temperature helps to reduce inflammation which also encourages the release of endorphins to counteract the feeling of pain in a natural way of your body healing itself. Therefore, this type of passive recovery is ideal for those who have suffered injury after an intense workout or incident. Also, the technology used in the chamber helps to increase your energy levels and metabolism which is great for weight loss and a mood boost. At first the shock of the cold temperature will spike your heart rate to keep you warm, but once your body has adjusted to the cooling state of the room, you will be feeling refreshed and restored in no time! The opposite of cryotherapy is that of an Infrared Sauna. This room differs from that of a regular sauna as it does not use heat and water vapour to soothe your body; it actually used panels along the walls which emit Infrared light and signals. These panels then are able to penetrate through your body, heating it up through to the bone without having to permeate the air. The heating sensation helps to relieve any tension from sore muscles or joint pain. It also has added bonuses of detoxification, weight loss, improved circulation and help with sleep. 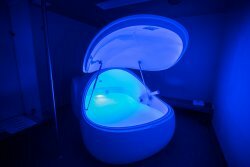 Flotation tanks are a great way to truly relax and restore the strength in your muscles after a strenuous workout. These tanks are filled with warm water and are dark capsules which allow you to recover by floating. Each pod is situated in its own room with changing and showering facilities to give you complete privacy so that you can enjoy the full experience one on one with yourself. These timed sessions provide you with ample time to relax your muscles in a warm and calming atmosphere. Another great way to practice passive recovery is through Migun Massage. Like that of the Infrared Sauna, this trend works using heating elements to soothe the muscles. This type of recovery involves you lying down on a specially designed bed which is contoured to the shape of the body. And within this bed are heated panels which emit warmth throughout the body based on contact with the bed by lying down, this therefore differs to that of the sauna. Along with the heating element of the bed it also has acupuncture, moxibustion and acupressure properties which lead to an overall relaxing experience. One of the easiest ways in which you can practice passive recovery is through sleep. Making sure you get an ample time to sleep is a great way to restore your energy and muscles after an intense workout. During your slumber your body goes into restoration mode and repairs yours cells in the process. Therefore, by giving yourself the recommended 7 hours to sleep after a day which included your fitness regime, your body is able to passively recover naturally. And as this form of recovery can happen in such a simple way, you can find that fitting this into your day to day regime very sustainable. Therefore if you are looking into passive recovery but not sure where to start, making sure your sleep is adequate would be an ideal way to go. Have You Tried any of these Passive Recovery Techniques? Within this article we have explored the top five different types of passive recovery techniques which you can try instantly! And after reading through this blog, we want to know if you have ever tried any of these trends and what your thoughts were on them. Find us over on our social media pages and let us know what you think and we can chat all things health and fitness. You can also shop our variety of exercise equipment over at Sports Fitness which you can use to enhance your recovery process. And we also have a range of sports clothing that you can upgrade your fitness wardrobe with in style.